 MCEC’s first outreach symposium, on catalysis and sustainability, was held last 14 December in the Academy Hall in Utrecht. ‘Fuelling the Future’ was aimed at a broad audience and open to anyone who was interested. Throughout the day, around one hundred guests were present for lectures by Ib Chorkendoff, Regina Palkovits, Peter-Paul Verbeek (University of Twente) and Ewald Breunesse (Manager Energy Transitions at Shell, who replaced Marjan van Loon who unfortunately was unable to attend). Cartoonist Paul Schenk summarized the event in drawings. 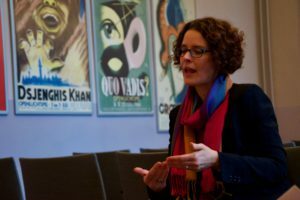 The topics and views presented, the presence of some protestors, as well as the interesting and very in-depth questions from the audience, made for a lively discussion round that continued well into the closing round of drinks. 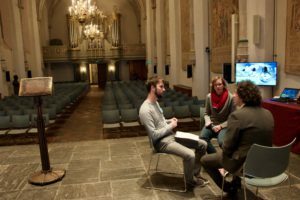 MCEC PhDs Jasper Lozeman, Jeroen Vollenbroek and Anne-Eva Nieuwelink interviewed the speakers on their lectures, research and (scientific) views. Their articles (both in English and in Dutch) will be published in full in February, on this website and on mcec-researchcenter.nl. If you’d like to stay tuned, please sign up for our newsletter!